Discussion in 'Mac Pro' started by imaximuss, Jul 20, 2011. Well today is new on Apple Store also Apple Cinema Display 27'' with Thunderbolt.. the Mac Pro 2010 don't have this port.. so I presume that an upgrade in this way will come soon..
You've got to laugh at Apples Big "Up yours". Everything but the "Pro" towers now has Cripple Peak technology. A Display that costs more than a desktop it can be plugged into. Woohoo, go Apple. Have a search, the 2011 Mac Pro update has been debated over and over. Q4 2011 is when most people think it will happen. I don't know, but i feel that Apple is kinda forced to do some kind of update on the MP very, very soon. All Apple HW now has TB and Sandy Bridge, the MP feels completely out of place. Q4 looks way too far away. I think the same thing... well... I hope it! You've got to laugh at Apples Big "Up yours". .
Yup, that's exactly how large corporate companies work. And whats the point adding this hardware for a socket that is obsolete in a few months? Mac Pro will be updated when X79 and LGA2011 is ready. They could start using AMD chips but Bulldozer is also delayed. Does the displayport out of the current mac pro work going into the new monitors thunderbolt connector. I assume it would. Is it a special cable or just the normal DP cable? No it does not. The Thunderbolt Display tech specs page lists system requirements, and the Mac pro is not listed as compatible. If you option up your Mac Mini enough you can get to the same price range! Or is that not a valid solution? I'm pretty sure it should work, but the ports on the back would not. That said, there were promo pictures of the Mac Pro hooked to the new display about a week back, so either it works, or the Mac Pro is about to be rev'd. Not necessarily. Your presuming the TB controller is bi-direction in backward compatibility with Display Port. Even if it is Apple wanting to deal with folks who call in complaining the ports don't work. Yeah. that is a solid foundation for actual specifications for a device. You can't add PCIe cards or other types of expansion, can't use internal desktop-class drives, can't have dual-ethernet ports.... yes, it's not really a replacement. I have two Mac Minis, I love them, but they are not a replacement for a Pro machine for Pro users. ...as opposed to them taking the picture for completely no reason? It hints at what may be coming. That's all. Obviously, they have plans to sell the display with Mac Pros. I'm pretty sure it is. The display signal on a Thunderbolt cable isn't even done under the Thunderbolt protocol. It's just a bog standard Displayport protocol. Nothing special. Even for dual mode devices. Hence them using the same port. If they refreshed the MP in early 2012 with new procs it wouldn't bother me too much. If so please note the Mac Pro is not connected to the display. How's that for significance in through pictures? A "pro" monitor, following in the legacy of the ACD 30" , would be a 30 bit color , 100+% gamut monitor like what the "pro" NEC , Ezio , etc. monitors are like. What Apple is doing is adding "more stuff" to a monitor that will probably go for $700-800 in the next year and tying to Apple only set-ups. Apple could strong arm some video card vendor into doing a GPU + TB card but that just putting a round peg into a square hole. Typically Apple doesn't do that. Not by the can't be. "Dual-channel 10 Gbps per port "
"... Bitrate 1.62, 2.7, or 5.4 Gbit/s data rate per lane; ... "
Note that DP gets max 5.4Gps per lane (graphic in right column). Intel was quoted as both the PCI-e and DP traffic travelling on separate lanes at 10Gps. Guess what? that isn't DP. It also makes sense if shipping the data for two large screens down one lane you'd need something faster than DP's top speed. Also the topology of the network is going to be "know" to TB so it should be shuttling the data from source to destination. Physically they are using a socket with the same 4 lanes. The protocol on those two lanes is different that DP or PCI-e . It is quite another thing when a non-TB cable plugs up and starts using legacy DP singals. That that point the TB control can switch to legacy mode and pass along DP over the 4 lanes and audio over the aux if they are all hooked up to the controller. Depends on what you need. If its anything approaching a solid graphics card, or expansion, the Mini is a nonstarter. 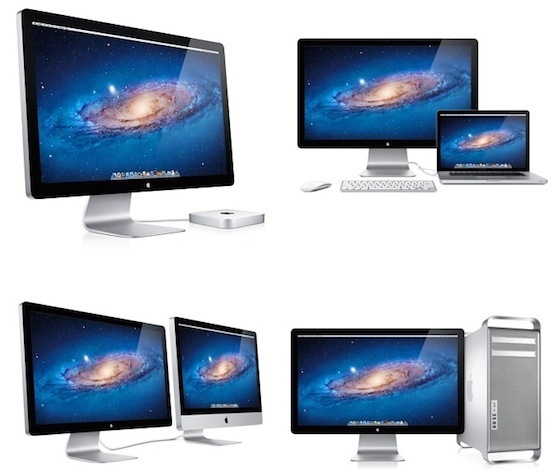 On the conference call Tim Cook mentioned that MacBookPros were the majority of the Macs that apple sells. That means 50+% . If you look at the motherboards of all of the mac products all of them except the Mac Pro have the GPU and CPU on the same board. Of course they are tilting the sole remaining monitor they make toward that architecture. Frankly, unless someone is manically infatuated with Apple's brushed Alum design for displays it really makes do difference to Mac Pros. The Pros have "standard" connectors which means they can connect to standard monitors. Just like the Mac Pro can hook to standard networking. Printers, FW devices , USB devices etc. Apple does not have to make all of those external devices. In fact they should stay away from most of them. Look, no need to blow this out or proportion. All I'm saying was Apple was ready to advertise the Mac Pro with the new display. The old one isn't hooked to the Mac Pro either in the promo picture. ZOMG! The Mac Pro must not support the old cinema display! Note that DP gets max 5.4Gps per lane (graphic in right column). Intel was quoted as both the PCI-e and DP traffic travelling on separate lanes at 10Gps. Guess what that isn't DP ? I'm still researching on this one. Where I disagree with you is that DP and PCI-e travel on different lanes. I don't think they do. I can't find any details supporting you, and the Intel documentation refers to a packet switching layer for DP and PCI-e traffic which heavily implies they travel on the same lanes. I just can't find any details of that specific part of the architecture. I'll get back to you. I'm still researching on this one. Where I disagree with you is that DP and PCI-e travel on different lanes. I don't think they do. Not sure what Intel document you are reading. "A Thunderbolt connector is capable of providing two full-duplex channels. Each channel provides bi-directional 10 Gbps of band- width. A Thunderbolt connector on a computer is capable of connecting with a cable to Thunderbolt products or to DisplayPort devices. " Unless they want to put some complex layered isochronous overhead on top ( they don't ) if you separate the PCI-e and DP traffic you don't have to worry about timing contraints to the two flows getting in each other ways. Were used back in the days when this was optical fiber. For optical fiber it makes more sense to single channel them. With copper wires it does not. Yes, the new Thunderbolt Display works with current Mac Pros, no problem. I'm going to go out on a limb and say that the display part will work, but not the ports on the back of the monitor. How's that. That's what I'm thinking. But people are claiming both sides, I'm not sure what the right answer is. No, the new Thunderbolt Display does not work with the current Mac Pro. The Thunderbolt is backward compatible with the mini Display Port, whereas the mini DisplayPort is not forward compatible with the Thunderbolt. When a Thunderbolt cable is plugged into a mini DisplayPort port, the mini DisplayPort port can not resolve the signal sent to it because of the PCI-e part of the Thunderbolt signal. On the other hand, when a mini DisplayPort cable is plugged into a Thunderbolt port, the Thunderbolt port can resolve the signal from the DisplayPort signal. This is actually what is meant by back compatibility.